Customers who purchase a new car from Toyota dealers in Miami will enjoy standard safety features. Automatic braking, lane departure alert, and automatically adjusting high beams will be standard on new Toyota RAV4 crossovers including the Toyota RAV4 Hybrid. Toyota Land Cruiser, and Toyota Avalon and Avalon Hybrid, Toyota Prius c, and Prius also have the Toyota Safety Sense package as standard equipment on their 2016 models. Safety is a priority for Toyota dealers in Miami. Heavy traffic, busy highways, and long commutes are a way of life for many Florida residents. 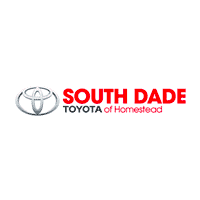 South Dade Toyota of Homestead is invested in the well-being and safety of our customers, and so being able to offer Toyota Safety Sense as a part of many of our new car standard equipment is very exciting. “We believe that the ultimate desire of a society that values mobility should be the eventual elimination of traffic fatalities and injuries. Studies indicate that advanced active safety technologies can have a profound effect on automotive safety.” – Bob Carter, senior vice president – automotive operations at Toyota Motor Sales, U.S.A. Inc. Luxury automobile manufacturers like Acura and Mercedes-Benz have offered this type of safety promoting technology to their customers for years as expensive add-on only options. Subaru currently has a similar option available for it’s Legacy, but it’s an $1195 upgrade. This news from Toyota makes automatic braking systems and the additional safety and crash avoidance they offer more accessible to the public, which keeps all of us safer on the Miami roads. For more information about how you can get into a new Toyota with the standard Safety Sense package, go ahead and contact our friendly staff here at the dealership.